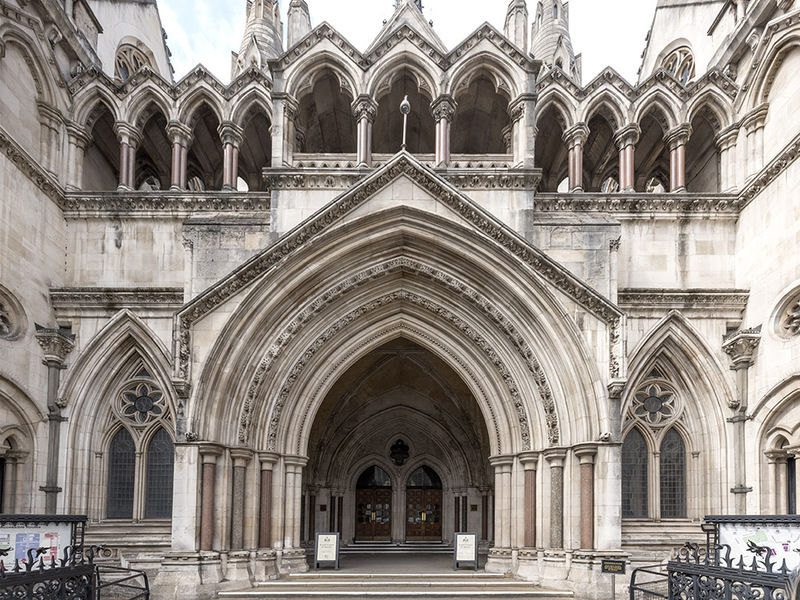 (Source: Royal Courts of Justice). The thought that public buildings are no longer really public appals me. Yes, you can go on a one hour tour. But the terms and conditions state: “Photography is not permitted. This could compromise the security of the judiciary or the privacy of those appearing at the Court. This policy is the courts (sic), and not ours.” British tax-payers pay for this; but they are not allowed to fully enjoy it, or take back lasting visual memories. The tourism industry misses a key dimension of the power of social media or illustrated reviews. I walk out disappointed. This remarkable-cathedral-like building with its neo-gothic nineteenth century arches is distinctly un-court-like. In fact many of the dozen or so people who tendered for the architectural assignment took from the brief that it was indeed a cathedral they would be building! But the entrance is fair game, so I shoot from the pavement! The winning architect in a contest of eleven eager aspirants for this remarkable edifice, was George Street. It was started in 1873 and opened by Queen Victoria in 1882. It houses the High Court and The Court of Appeal. 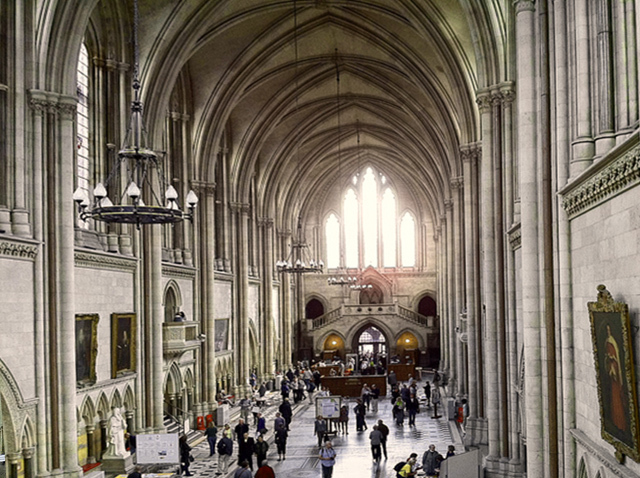 It’s surrounded by the four Inns of Court, as well as other leading academic buildings. After a very brief glance inside – epic and awesome describes it – pictures would mean so much more, -I walk east once more. A building calling itself the Old Bank of England soon after intrigues me. I venture in the sulubrious entrance. No banking here. 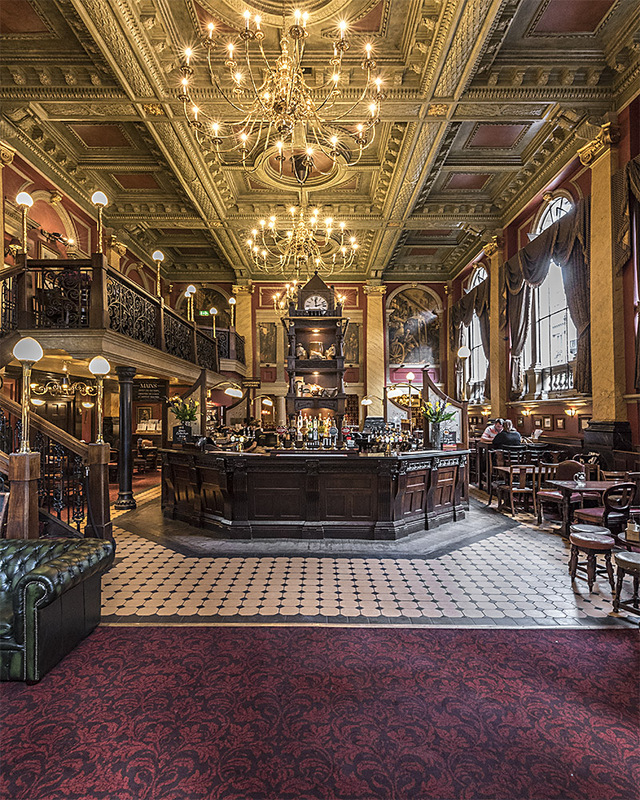 It’s now an upmarket pub with a splendidly restored salon in which, no doubt, many a banker would feel amply at home. It’s mid-afternoon. But the degree of thirst on a mild Summer afternoon is insufficient to call me to the bar! As I look up at the buildings I pass several buildings obviously pre-war, either survivors of the blitz or restored. Suddenly there’s a sign: To Dr. Johnson’s House. As someone who loves words, I had to see the home of Samuel Johnson for myself. I pick my way through narrow passages, filled with office workers catching a sly cigarette, and updating their personal social media pages. One wonders how much productivity is still lost to this iniquitous weed. After twists and turns, one turns into a courtyard. There it is; a simple black door and a Jacobean brick building of four storeys. I sound the bell and an indistinct grabbed electronic voice bids me inside. “Four pounds – take your time and make sure you get right to the top. Each floor has its own stories.” The elderly lady is one of those uniquely British stalwarts. Well past retirement age, she has that splendid, indomitable strength and direct eye contact that reassures one that the afternoon is to be well spent. The downstairs reception room – is barely three metres by three metres, where Johnson would initially welcome visitors. And what visitors they were: The painter Sir. Joshua Reynolds, Garrick the actor, Boswell the writer (and his biographer), and a host of acquaintances and political influencers too many to mention. And yet he married into money but it seems was seldom happy, and for most of his life he was dependent on the goodwill of others for his livelihood, being hopeless with money and often in debt, inadvertently. It’s his remarkable Dictionary of the English Language, containing 44,000 entries and achieved in just eight years, for which he is most remembered. It was another 150 years when The Oxford English Dictionary appeared in 1928 before there was another work to supplant it. And that was the work of scores of academics and seventy years or so. Johnson’s was essentially a solitary work of extreme dedication and scholarship. 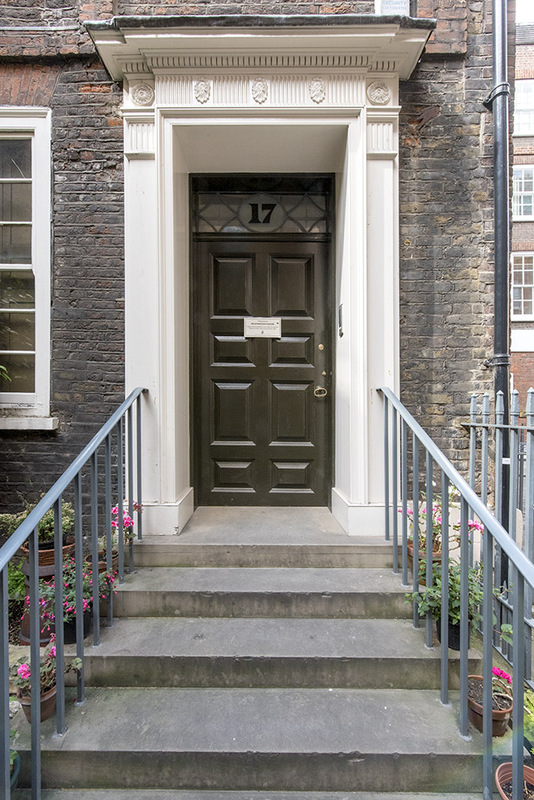 The various rooms at 17 Gough Square are simple. 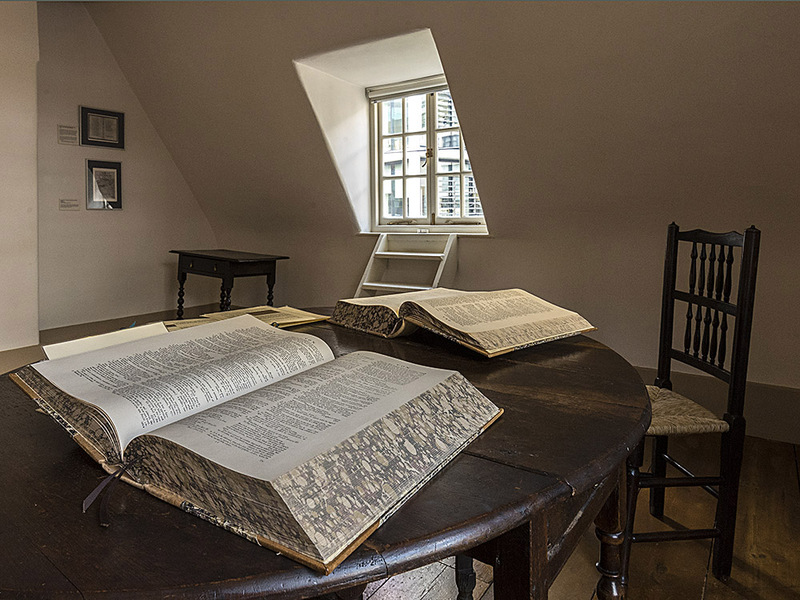 But the reading room at the top of the house is the one that left me with a sense of Johnson’s presence. This room. This table. That window. Just imagine all the challenges of scrounging books of learning, earlier dictionaries, doing his own etymology research to find first uses, meanings, transformations. We are forever in his debt. And so as four o’clock strikes on a host of nearby church bells, I gather my things and head to St. Paul’s. It’s to the end of Fleet Street, across Ludgate Circus, now looked down on by dozens of modern glass buildings which have arisen in the past four decades since I left England. The bustle and noise of constant traffic is overwhelmingly intrusive. Up Ludgate Hill, towards the banking district. Finally as the road bends round in a gentle curve to the right we get our first sight of St. Paul’s. Before too long the road opens up, giving way to an open space and full sight of Christopher Wren’s finest work. That the design went through many mutations as it was built, that the burghers of London rejected his much more Catholic Italianate design in favour of a ‘more Protestant’ style, still has allowed us to enjoy what rose from the Ashes of 1666, amidst a project of rebuilding the 85 or so lost churches of London. And it was Christopher Wren ( 1632-1723,) who designed or was influential in no less than 51 new City churches. Wren was in fact a scientist until into his thirties. 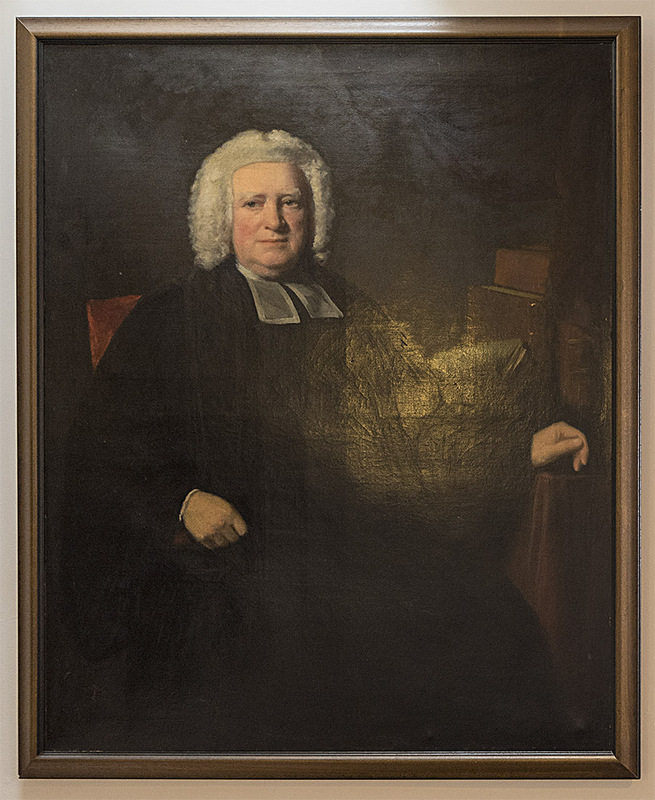 He was Professor of Astronomy at Gresham College in London at just 24. A request by his uncle, the Bishop of Ely, led to his first building – a chapel for Pembroke College, Cambridge.This led to the design the Sheldonian Theatre in Oxford, his first domed building the same year. 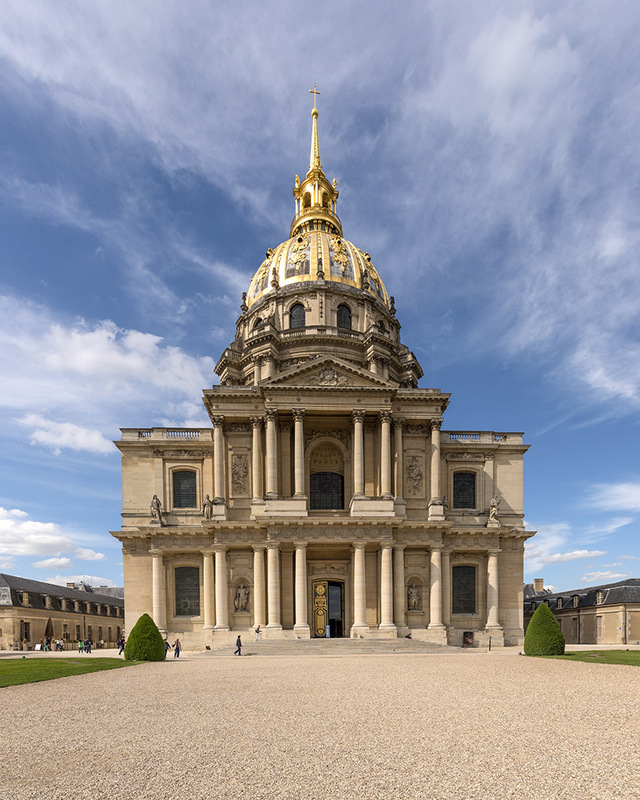 Despite his use of many Italian design influences, his only visit outside of England, was to France, where he saw the remarkable dome of Les Invalides. His sound knowledge of structures and maths came from his self-study of the work of Michelangelo and the pioneering Italian baroque architects of Florence, It gave him the inspiration and the knowledge required to pull off so many fine designs. Appointed as Surveyor of the Royal Works in 1669 at just 36 years of age, Wren, more than anyone of that time, influenced the rebuilding of the city of London after the Great Fire. A grouping of fellow scientists that he was instrumental in forming, was later to become the revered by-invitation Royal Society, granted the Royal Charter by King Charles II in 1662. Knighted in 1673, Wren had studied the written works of the Italian master Palladio and knew by reputation and books, the story behind Brunelleschi’s Il Cupoloni dome in Florence, built two hundred years earlier. Here was the first use of a cast iron chain in support of one of the inner skins to the roof, a concept found in St. Paul’s. The St. Paul’s website details the methods used by Wren and his team first to calculate, and then construct the three-level dome here. 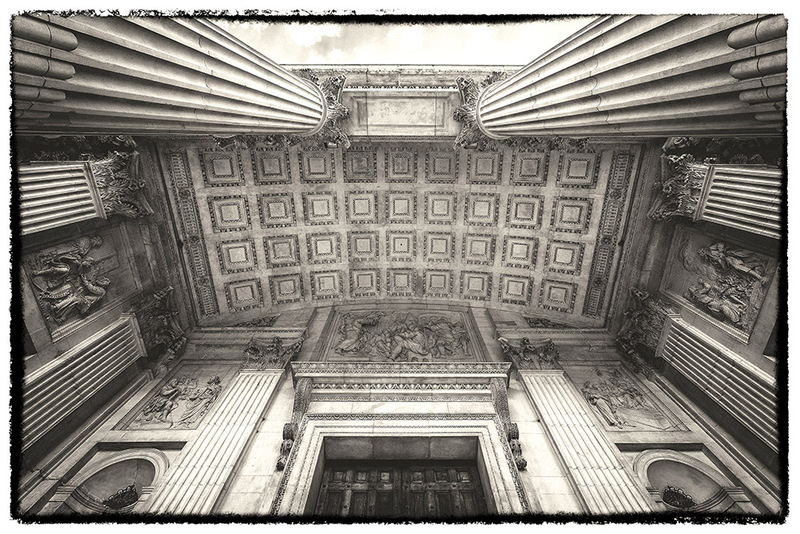 Having visited multiple churches in Florence, St. Peter’s in Rome and most recently Les Invalides in Paris, there are clear resonances from all these earlier buildings. All are remarkable, considering the materials handling, lifting and mathematical calculations required all those years ago. 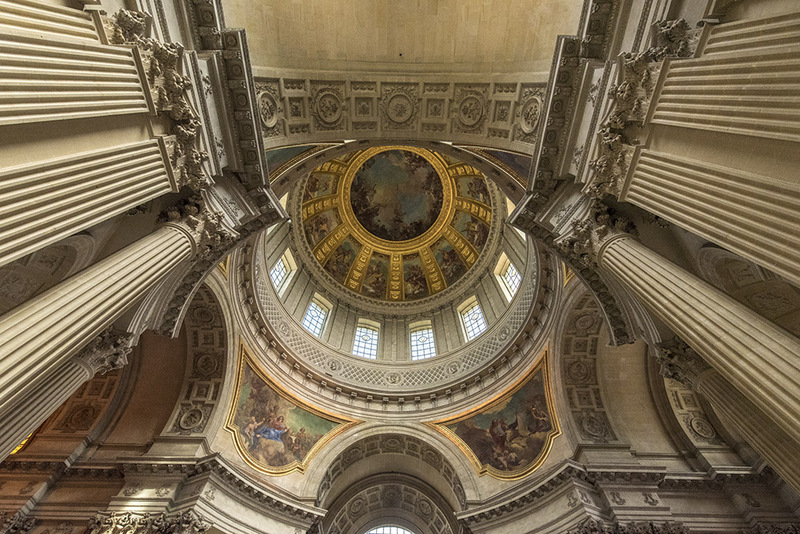 The interior complexity of Les Invalides was just a spur to his mathematical mind. 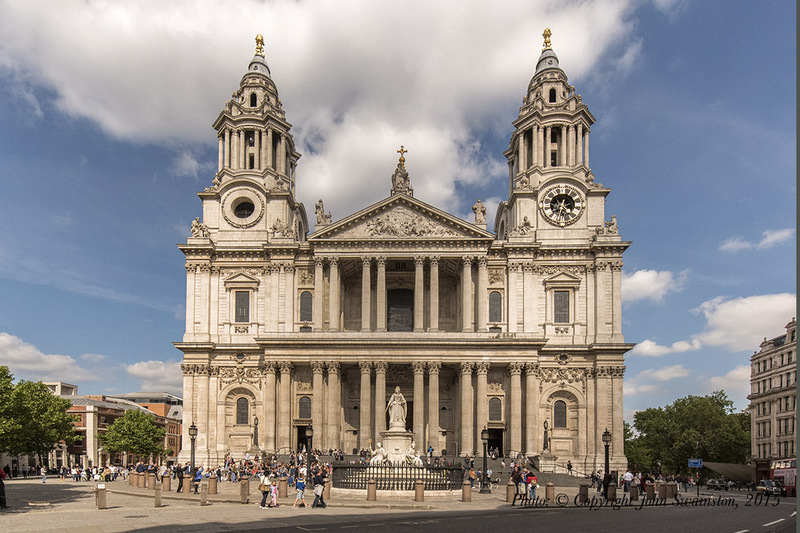 The final work on St. Paul’s was completed in 1708, with an impressive series of columns and arches leading into the naive. Great drafting skills and applied maths from his astronomy studies years earlier have given us this magnificent building. That I can’t show any of the interior features is the result of restrictions of any kind of photography by the public. The portico is the last point photography is allowed. But it’s columns and ceiling are indeed impressive. You’ll just have to go and visit it yourself! You’ll be inspired by the wonderful white marble and the awe-inspiring interior mouldings and stonework. And it was all because of the he massive London fire. Wren just seized the day. In fact within 10 days of the end of the fire, he put up an unbidden proposal to rebuild London, and to build it again, grander, safer and stronger. His success is our heritage today. I left St, Paul’s as evensong got under way. As a youth I sang in many choirs and remember with great fondness the various settings of Choral Evensong: Charles Villiers Stanford, Ralph Vaughan Williams, Harwood, Dyson and Leighton. The echo decay times of cathedrals are typically 0.9 to 1.1 seconds. St. Paul’s has a decay time of almost two seconds. Today the music of John Rutter has extended this fine office of music to a contemporary British congregation. Whether you are Anglican or Catholic, Buddhist or Muslim, or someone seeking their own way without formal religion, hearing such music in one of Wren’s or Gibbs’ great churches, will inspire and console, regardless almost any man or woman. Note: This was going to be a Two-part blog. But there is so much to celebrate in Wren, and In London, as noted by Dr. Johnson. Greenwich is still ahead and will come in a third part, in which we’ll also look at some of the other dozens of churches Wren built in his 90 plus years -most of which, in some form, still stand today. Till we meet again! © All text and pictures are Copyright John Swainston, 2012, 2013 and 2015 and may not be reproduced in any form without permission. All rights reserved. Previous Previous post: How pleasant to know Sir Christopher Wren! Next Next post: Why is Political Leadership in Australia so absent on The Environment?